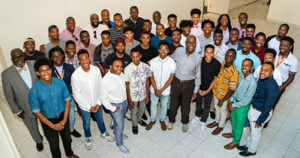 NEW YORK, NY (BlackNews.com) — Personal development, empowerment, and accountability are primary focus areas of From the Fire: Leadership Academy for Young Men, operated by At the Well Conferences, Inc., a provider of events for teens since 2009. The two-week boarding program is located at Princeton University and is tailored to minority male students from diverse socioeconomic backgrounds who are currently high school freshmen, sophomores, or juniors. From the Fire seeks to cultivate scholars through leadership development, mentorship, and a rites of passage program. This year’s keynote speaker is Danny Glover, the acclaimed film, television, and theater actor and producer whose career has spanned more than 30 years. Some of his most notable works include The Color Purple, Lethal Weapon, Predator, Master Harold and The Boys. Glover is also well known and respected for his advocacy and philanthropic efforts in health care, education, and economic justice. Glover has supported United Nations campaigns focusing on poverty, disease, and economic development in Africa, Latin America, and the Caribbean. Mr. Glover was appointed as a UNICEF Goodwill Ambassador in 2004. From the Fire’s research-based curriculum is designed by a team of educators and leaders with decades of experience in adult and young adult education, social change activism, and community development. It is rooted in the spiritual and intellectual traditions forged in response to the injustices faced by African Americans and other minority groups around the world. The program’s core beliefs and practices are guided by an indomitable faith in the courage, creativity, resilience, and potential of the students. The leadership development component will provide transformative education in the form of small group projects, critical reading and writing sessions, a financial aid and scholarship boot camp, dynamic speakers, and interactive leadership workshops. Mentorship is offered as a form of “deep caring” in order to overcome widespread indifference to and mainstream perceptions of these vulnerable young men. Each participant will be paired with a dedicated, trained mentor. The rites of passage component will be a journey of self-discovery that unlocks the hidden resilience of the students that is fundamental to their manhood. Included are a host of experiential activities that create and hone essential life skills. The program will conclude with a memorable closing ceremony as well as surprise guests. Due to overwhelming demand from families, At the Well Conferences is adding an additional 9th Grade Weekend Intensive Experience for From the Fire for 8th and 9th grade boys August 2-4 2019! This 3-day leadership retreat will expose the students to the core elements of the summer program and reward participants with an admission advantage for the 2020 Academy. Tuition is only $995 for this life changing weekend. Workshops for parents will be included in the Weekend Intensive experience as well. Please register early only 40 spots are available for this year!